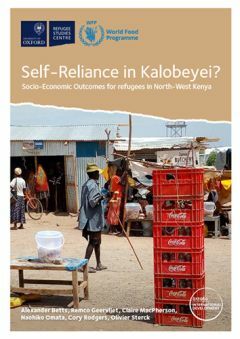 This report from the Refugee Economies Programme compares the socio-economic situation of South Sudanese recent arrivals (post-2015) living in the new Kalobeyei settlement (set up under a ‘self-reliance model’) to the situation of recent arrivals living in the old Kakuma camp (under an ‘aid model’). It examines three central questions: How can we measure self-reliance for new arrivals in both contexts? To what extent is self-reliance greater in the new Kalobeyei settlement compared with Kakuma camp? And how can self-reliance be enhanced in such a difficult environment? In addition to outlining a methodologically innovative study, the report also proposes policy recommendations.